"Cooking rack of lamb can be intimidating for many people, but this elegant recipe is so easy to prepare it will soon become a staple in your entertaining repertoire." Stir ketchup with Worcestershire sauce, vinegar, garlic, parsley, oregano, lemon zest, pepper and salt. Divide mixture in half. Thread onion slices onto skewers so that they resemble lollipops. Brush half the marinade over lamb and onions. Marinate for 15 minutes. Preheat grill to medium. Set onions and lamb on grill, meaty side down. Grill, turning and basting often, for 25 minutes or until medium-rare. Grill onions for the same time, turning as needed. Rest meat for 10 minutes. Cut into 2 rib portions. Serve with onion rings. Twist 1: For an indoor version, roast lamb in a 425° F (220° C) oven for about 25 minutes, basting often. Twist 2: For the most tender lamb, cook the racks until the internal temperature is 140° F (60° C) for rare or 150° F (65° C) for medium-rare. 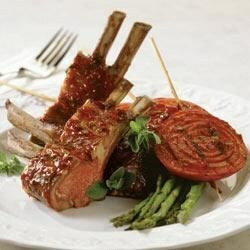 Twist 3: For a complete gourmet supper, serve lamb with grilled new potatoes and steamed green vegetables. Cooked just as it is written. Turned out perfect. Will save this and do again. Super easy and delicious. I marinated the meat for the afternoon. The flavor was wonderful and the red onion adds a nice added flavour. Will definitely make again and again. This was excellent!! I made it as posted and was very pleased with the sauce. It would be excellent on other meats as well.